Intel vs. Qualcomm: Which Chip Giant Won Q2 Earnings? Breaking down the earnings result from the two chip titans. Whether justified or not, semiconductor giants Intel (NASDAQ:INTC) and Qualcomm (NASDAQ:QCOM) are not infrequently compared to one another. The two chip giants have gone down somewhat divergent paths of late, in part because they excel in different areas of one of tech's most important industries. The two chip rivals also reported earnings last week with some interesting results. So which company reported the more impressive earnings this time around? Let's take a look. The headline numbers certainly don't read nicely for Intel. Despite sales rising 2.6%, to $13.5 billion, the company saw its quarterly net income decline 51% to $1.3 billion. The primary culprit behind Intel's profit decline was a $1.4 billion restructuring charge that the company booked for the quarter as part of the reorganization that Intel announced in April. Backing out this and other nominal costs, non-GAAP net income totaled $2.9 billion for the quarter, still down 6% compared to the year-ago period's non-GAAP profits. Intel's stock sank 3% in the wake of the report. The primary point of concern among investors appears to be the pace of expansion within Intel's server chip business, perhaps its most-compelling growth opportunity amid the shrinking market for PC processors. Revenue in Intel's Data Center Group increased less than expected, rising just 4.5% versus last year. Though weathering structural shifts to its core business, this was not one of Intel's more-memorable quarters. So how did its rival Qualcomm fare? San Diego-based Qualcomm issued its most-impressive earnings release in recent memory. Thanks to improved reporting from its long-standing problems with Chinese smartphone OEMs, Qualcomm saw its sales increase 3.6% to $6.0 billion. For context, Qualcomm's revenues had seen double-digit declines in each of its last four quarterly reports. Unlike Intel, Qualcomm's dual-segment business model is based almost entirely on mobile chip technologies. Sales in Qualcomm CDMA Technologies (QCT), the segment that makes and sells smartphone processors and modems, saw revenue remain flat versus the year prior. Though QCT, which generates about two-thirds of Qualcomm's sales, saw its revenue growth stagnate, the division did enjoy a nice uptick in profitability with earnings before taxes (EBT) rising from $289 million to $365 million. Turning to the company's real profit center -- its Qualcomm Technology Licensing (QTL) division -- the segment notched a 6% rise in sales and EBT during the quarter. As referenced earlier, Qualcomm's principal headwind of late has been an ongoing patent-enforcement issues with Chinese smartphone manufacturers. Owing to its pivotal role in developing mobile communications standards, Qualcomm owns a trove of patents for 3G and 4G mobile networks. Thanks to its intellectual property war chest, Qualcomm has traditionally been entitled to receive royalty payments from smartphone manufacturers. However, in the past several years, handset makers in China began underreporting, or outright skirting, their payments to Qualcomm, a situation that triggered litigation from Qualcomm. After quarters of legal give and take with the Chinese government and OEMs, Qualcomm finally reached an agreement on patent enforcement earlier last year. However, questions as to the degree to which Qualcomm's new agreement will be enforced in China looms large in investors' minds. It's worth noting that this storyline is ongoing, but it also appears that the worst -- in terms of royalty collection -- may finally be in Qualcomm's rearview mirror. This probably shouldn't come as a surprise to anyone making it this far into the article. Qualcomm's earnings report trumped Intel's. Importantly though, that isn't the same as saying that Qualcomm is the better buy. What about their respective valuations? 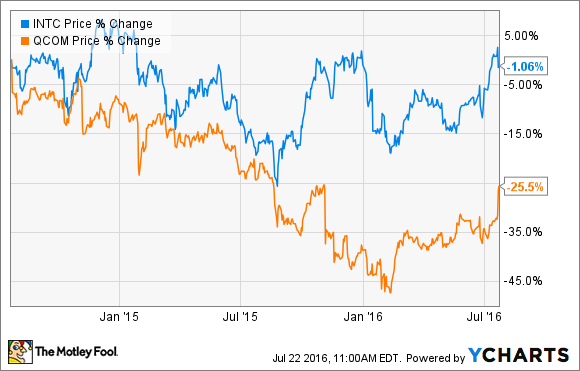 As it turns out, Qualcomm and Intel trade at relatively similar valuation multiples. After its post-earnings rally, Qualcomm trades at a price-to-earnings ratio of 17.9 versus Intel's earnings multiple of 16.7. It's also worth mentioning that Qualcomm's 3.5% dividend yield also slightly exceeds Intel's, which yields 3%. At the end of the day, both Intel and Qualcomm have unique issues and risk factors. Intel must find a way to offset the decline in PC microprocessors. Its data center and Internet of Things (IoT) chip businesses offer intriguing new growth opportunities, though as we saw this quarter, these segments aren't immune to softness, either. For Qualcomm, the company's intellectual property franchises remains in the crosshairs of antitrust regulators around the world, most notably in the EU. Any major new headwind undoubtedly threatens the company's investment outlook. While Qualcomm might edge out Intel in terms of this specific report and its potential growth runway, investors must fully understand each company's unique risks before buying either Intel or Qualcomm.